Photo: Male Water Competition Team was named Team of the Year; Newport SLSC U19: Some of the Newport under 19 boys at the awards night in Sydney on Saturday: From left: Jacob Nielson, Lachie Reid, Cody Marr, Max Brooks, Jonah Beard and Fletcher Davies. Also in the team were Bodi Smith, Cooper Halligan, Peter Euers and Jayke Rees. 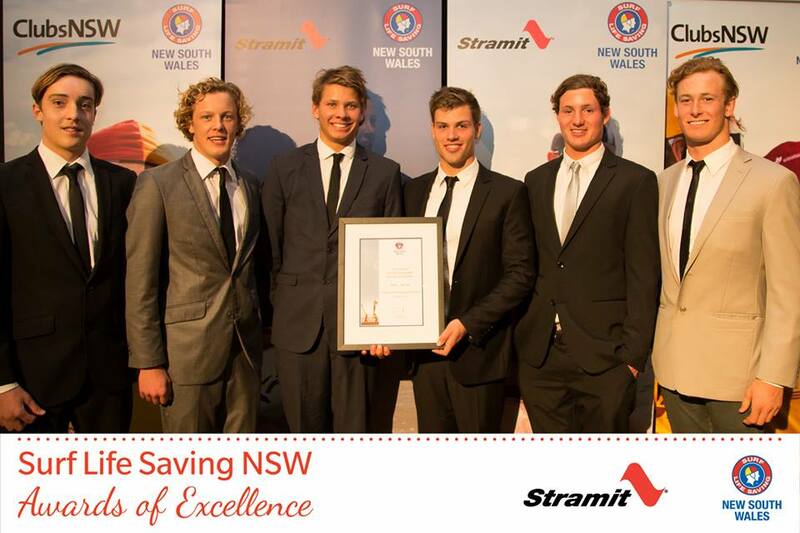 A multitude of Sydney Northern Beaches surf lifesavers have received top honours at the annual Surf Life Saving NSW Awards of Excellence proudly presented by Stramit Building Products on Saturday. The Awards of Excellence acknowledge surf lifesavers from throughout NSW who have performed invaluable public service as lifesavers, administrators or trainers within the community. Former lifesaver of the year, Andy Cross (South Narrabeen SLSC), has once again been recognised for his outstanding service to surf life saving winning the Volunteer of the Year Award. Andy has volunteered more than 400 hours this season as a patrolling member, Branch Duty Officer, RWC & Surfcom Radio Operator. Andy is the Chief Training Officer and Assessor for his club, having committed an estimated 235 hours in these roles. He is involved in water safety for nippers, organising junior club activities, a carnival official and announcer. Andy designed and organised a surf lifesaving challenge for a TV reality show of which South Narrabeen was the host club. In a very special moment, Andy accepted his award with an emotional tribute to his younger brother who recently passed away. "I'd like to dedicate this award to my brother and to also thank surf lifesaving for being the biggest family I've been a part of. "I joined the South Narrabeen Surf Club in 1992 for my kids and I've never looked back," he said. Sydney Northern Beaches’ dominance in surf sports over the last year was reflected with the branch taking out a number of sports related awards including Athlete, Young Athlete, Team and Official of the Year. Newport’s Max Brooks was named NSW Athlete of the Year following a banner year of competition. Max won six gold medals at the Australian Surf Life Saving Championships and seven at the NSW Championships and was also named Male Competitor at the Aussies in Perth last season. "Just when you think it has ended, it keeps getting better. It's unreal winning this award [Athlete] and even more special to be part of the Under 19 male water competition team. It tops it off and is testament to all the hard work from everyone involved,'' he says. Max is currently preparing for the Nutri Grain ironman trials at Salt Beach on September 6 and 7. Only the top four qualify and Max expects around 60 ironmen to compete at the trials. The Newport SLSC U19 Male Water Competition Team was named Team of the Year. With a record of 12 wins from 15 events at Branch, 12 wins from 15 events at State and 8 wins from 15 events at the Australian Championships this team has demonstrated an unparalleled level of ability and success at the highest level. For the second year in a row, Georgia Miller (Manly LSC) has been named the NSW Young Athlete of the Year. At the NSW Championships, Georgia won ten gold medals in both the open and U19 divisions including the Ironwoman race for both ages. At a national level Georgia managed to win gold medals in the U19 Female Ironwoman as well as the U19 female board relay event. On top of these outstanding results Georgia was also selected in the NSW Interstate Team as well as the Australia Rescue 2014 Team. Georgia has recently joined Newport but won NSW Young Athlete of the Year while competing for Manly LSC. Along with Max, she will be competing at the Nutri Grain iron trials at Salt Beach [Far North Coast] on September 6 and 7. Louis Tassone (North Curl Curl SLSC) was named Surf Sports Official of the Year. Louis has played a major role in local, state and national SLS events in the past season. He took on a key role with the Sydney Northern Beaches Board of Surf Sports as the carnival advisor and has been responsible for helping to develop and implement improvements to carnivals that run within the branch. Louis was appointed Beach Referee for the NSW Open Championships, NSW Interbranch and Interstate carnivals this year, and was also appointed as the Sectional Referee for the Beach Area for this year’s Australian Surf Lifesaving Championships. Freshwater lifesaver Tod Rowbotham was awarded Rescue of the Year for his heroic rescue of a surfer in April in dangerous three metre waves at Freshwater Beach. Zachary Dibben and Jessica Cotterill of Dee Why SLSC were awarded the Initiative of the Year for their innovative ‘After Dark Youth Program’. The program aims to engage young members and educate them on the member pathways that are available to them in surf life saving and is designed to improve leadership skills and increase youth retention and recruitment within the youth demographic between 14-25 years of age. More than 280 of Surf Life Saving’s most outstanding lifesavers, athletes, coaches and administrators gathered to celebrate the enormous contribution of volunteers and clubs from across NSW for the 2014 SLSNSW Awards of Excellence proudly presented by Stramit Building Products. For a full list of all the winners please visit the SLSNSW Awards of Excellence event page. 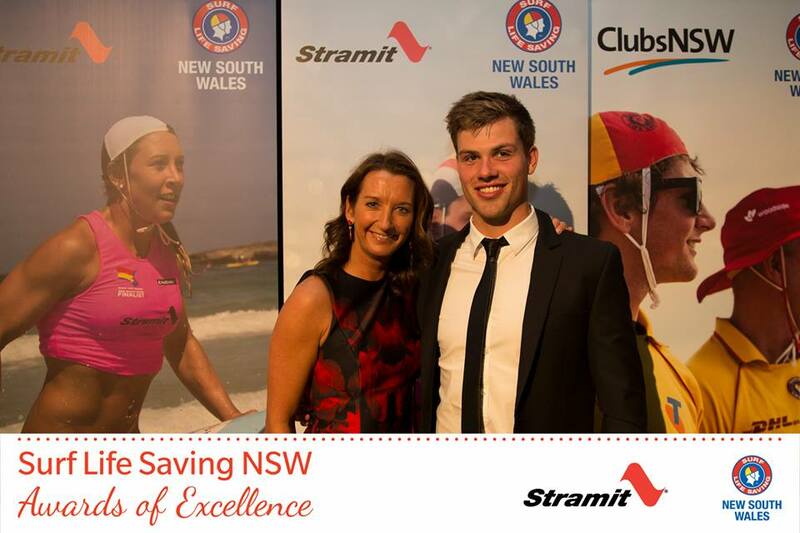 Bondi’s Dori Miller, has been named the NSW Masters Athlete of the Year at the annual Surf Life Saving NSW Awards of Excellence proudly presented by Stramit Building Products on Saturday, August 16th. The Awards of Excellence acknowledge surf lifesavers from throughout NSW who have performed invaluable public service as lifesavers, lifeguards, administrators or trainers within the community. Dori only started competing in surf lifesaving three years ago at age 40, and in that time has earned 17 Australian gold medals, five Pool Rescue world records and eight Pool Rescue Australian records. Her most recent world records were above and beyond any competitor from any category, open or masters. In the past 12 months Dori earned four gold at the 2013 Pool Rescue Championships in the Masters and one gold, two silver and a bronze in Open events. At the Australian Surf Life Saving Championships this year she won three gold medals and a silver medal. Outside of Surf lifesaving, Dori has completed three successful solo crossings of the English Channel including an incredible double crossing (approximately 78km) which was recently completed in August. In other results on the night, Crowdy Head lifesaver, Allan Davis, was named the NSW Lifesaver of the Year for the 2013/14 season. Max Brooks with Layne Beachley - Layne was MC for the evening. Winner Surf Lifesaver of the Year: Allan Davis, Crowdy Head SLSC! Winner Volunteer of the Year: Andy Cross, South Narrabeen SLSC!